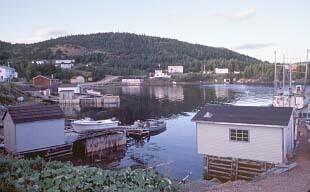 communities of Port Anson & Miles Cove. "Port Anson, situated on the southwestern shore of Sunday Cove Island, is surrounded by lavish green forest, fertile land and the natural beauty of the sea. These characteristics undoubtedly enticed the early settlers to this region. 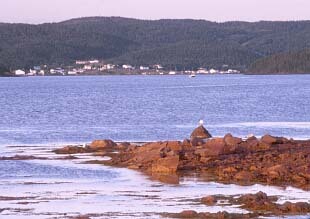 Originally known as Sunday Cove Tickle, then as Newtown, the community was renamed Port Anson in 1903. It is believed Newtown earned its name in the 1800's through the simple reasoning that it was a new area which people began to inhabit. The settlement was later christened Port Anson because there was another community by the name of Newtown in Notre Dame Bay." 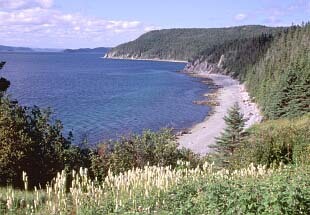 "Miles Cove, a small community surrounded by rugged hills and sparkling blue ocean waters, is located on the east side of Sunday Cove Island. Prior to 1911 Miles Cove did not appear in any census. It came under Sunday Cove Island where the total population was 45 for that year. Although it is not often remembered as a self-employment community, between 1898 and 1899 a total of 210 tons of copper ore was taken out of the mine at Miles Cove. After the ore was removed it was trans-ported to ships docked in the local har-bour. This was done by means of a cable, which ran over a hill locally known as Stores Burnt. This cable stretched from the mine site to the waterfront and buckets filled with ore would travel down it to waiting ships. The containers would then be emptied and pulled back up the cable to be refilled. 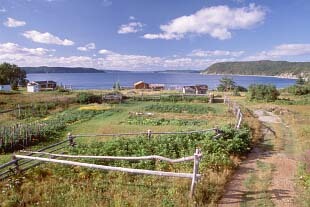 Early settlers depended upon the local fishery, the French Shore and Labrador fisheries, and the lumberwoods for sources of income. Today some of the residents are diamond drillers while some still depend on logging and fishing." Excerpt from moments in time, Green Bay Economic Development Association 1994. Port Anson from the causeway.